What do we mean by the "Passion" of Christ? The Passion of Christ, from the Latin patior meaning "suffer," refers to those sufferings our Lord endured for our redemption from the agony in the garden until His death on Calvary. The Passion Narratives of the Gospels provide the details of our Lord's passion, and at least to some extent, they are corroborated by contemporary Roman historians — Tacitus, Seutonius and Pliny the Younger. Archeological discoveries combined with modern medical examination provide an accurate picture of what our Lord endured. In an age where the "risen" Jesus appears on the cross and "suffering" and "sacrifice" have become unpopular terms, we must not lose sight of the reality of the passion. After the Last Supper, Jesus went to the Garden of Gethsemane at the Mount of Olives. Our Lord prayed, "Father, if it is your will, take this cup from me; yet not my will but yours be done" (Lk 22:42). Jesus knew the sacrifice He faced. He prayed so intensely that "his sweat became like drops of blood falling to the ground" (Lk 22:44). Medical science testifies that people may emit a bloody sweat when in a very emotional state (a condition called hematidrosis or hemohidrosis), the result of hemorrhaging into the sweat glands. Little wonder the Father sent an angel to strengthen Him (Lk 22:43). Our Lord was then arrested and tried before the Sanhedrin, presided over by the High Priest Caiphas. Responding to their questions, He proclaimed, "Soon you will see the Son of Man seated at the right hand of the Power and coming on the clouds of heaven" (Mt 26:64). For this statement, He was condemned to death for blasphemy, and was then spat upon, slapped, and mocked. While the Sandhedrin could condemn our Lord to death, it lacked the authority to execute; only Pontius Pilate, the Roman governor, could order an execution. The Jewish leaders, therefore, took Jesus to Pilate. Notice how the charge changed: The Jewish leaders told Pilate, "We found this man subverting our nation, opposing the payment of taxes to Caesar, and calling Himself the Messiah, a king" (Lk 23:2). What happened to the charge of blasphemy? Pilate did not care if Jesus wanted to be a messiah, a prophet, or a religious leader; however, if Jesus wanted to be a king, He threatened the authority of Caesar. Any act of rebellion, treason or subversion has to be punished quickly and severely. So Pilate asked, "Are you the king of the Jews?" (Lk 23:3). Pilate could not find conclusive evidence to condemn Jesus. Pilate challenged the chief priests, the ruling class, and the people, "I have examined Him in your presence and have no charge against Him arising from your allegations" (Lk 23:14). When offering to release a prisoner, Pilate asked the crowd about Jesus: "What wrong is this man guilty of? I have not discovered anything about Him that calls for the death penalty?" (Lk 23:22). Even Pilate's wife pleaded with him not to interfere in the case of "that holy man" (Mt 27:19). Pilate then had Jesus scourged (Jn 19:1). The Romans used a short whip (flagrum or flagellum) with several single or braided leather thongs. Iron balls or hooks made of bones or shells were placed at various intervals along the thongs and at their ends. The person was stripped of his clothing and whipped along the back, buttocks and legs. The scourging ripped the skin and tore into the underlying muscles, leaving the flesh in bloody ribbons. The victim verged on circulatory shock and the blood loss would help determine how long he would survive on the cross. To enhance the scourging of our Lord, the soldiers added other tortures: crowning Him with thorns, dressing Him in a purple cloak, placing a reed in His right hand, spitting upon Him, and mocking Him, "All hail, king of the Jews!" (Mt 27:27-31). After the scourging, Pilate again presented Christ to the crowd who chanted, "Crucify Him, crucify Him!" Fearing a revolt, Pilate capitulated and handed over Jesus to be crucified. The Romans had perfected crucifixion, which probably originated in Persia, to produce a slow death with the maximum amount of pain. Crucifixion was reserved for the worst of criminals. This punishment was so awful that Cicero (d. 43 BC) introduced legislation in the Roman Senate exempting Roman citizens from crucifixion; this is why St. Paul was beheaded rather than crucified for being a Christian. The victim carried his own cross to further weaken him. Since the entire cross weighed around 300 pounds, he usually carried only the horizontal beam (patibulum) weighing 75-125 pounds, to the place of execution where the vertical beams (stipes) were already in place. A military guard headed by a centurion led the procession. A soldier carried the titulus which displayed the victim's name and his crime, and was later attached to the cross (Mt 27:37). For our Lord, the path from the praetorium to Golgotha was about 1/3 of a mile, and He was so weak Simon of Cyrene was forced to assist Him (Mt 27:32). Upon arriving at the place of execution, the law mandated the victim be given a bitter drink of wine mixed with myrrh (gall) as an analgesic (Mt 27:34). The victim was then stripped of his garments (unless this had already occurred). His hands were stretched over the patibulum and either tied, nailed or both. Archeological evidence reveals the nails were tapered iron spikes approximately seven inches in length with a square shaft about 3/8 of an inch. The nails were driven through the wrist between the radius and the ulna to support the weight of the person. The patibulum was affixed to the stipes, and the feet were then tied or nailed directly to it or to a small footrest (suppedaneum). As the victim hung on the cross, the crowds commonly tormented him with jeers (cf. Mt 27:39-44). The Romans oftentimes forced the family to watch to add psychological suffering. The soldiers divided the man's garments as part of their reward (Mt 27:35). The victim would hang on the cross anywhere from three hours to even three days. As he hung in agony, insects would feed on the open wounds or the eyes, ears, nose, and birds in turn would prey on the victim. With the combined effects caused by the loss of blood, the trauma of scourging and dehydration, the weight of the body pulled down on the outstretched arms and shoulders impeding respiration, the person dies from a slow asphyxiation. Perhaps this is why Jesus spoke only tersely from the cross. If the person tried to life himself up on his feet to breath, incredible pain would be felt at the nail wounds and the back wounds from the scouring. To hasten death, the soldiers would break the legs of the victim (Jn 19:32-33). When he appeared dead the soldiers insured the fact by piercing the heart with a lance or sword; when Jesus' heart was pierced, out flowed blood and water (pericardial fluid) (Jn 19:34). Commonly, the corpse was left on the cross until decomposed or eaten by birds or animals; however, Roman law allowed the family to take the body for burial with permission of the Roman governor. In our Lord's case, Joseph of Arimathea asked Pilate for Christ's body, and He was then buried (Jn 19:38). As we contemplate Holy Week, we must remember what our Lord endured for our salvation. He offered Himself as the perfect sacrifice for sin on the altar of the cross and washed away our sins with His blood. 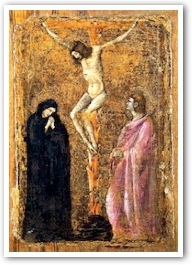 We also must recognize our responsibility to repent of sin: The Catechism (#589), quoting the old Roman Catechism, asserts "Sinners were the authors and the ministers of all the sufferings that the divine Redeemer endured" and "Since our sins made the Lord Christ suffer the torment of the cross, those who plunge themselves into disorders and crimes crucify the Son of God anew in their hearts (for He is in them) and hold Him up to contempt." Our crucified Lord on the cross is a vivid image of His love for each of us. Meditating on His passion will strengthen us against temptation, move us to frequent confession, and keep us on the path of salvation. By embracing our crucified Lord and His cross we will come to the glory of the resurrection. Saunders, Rev. William. "The Passion of Jesus Christ." Arlington Catholic Herald.